Individual access to subscriber content is controlled through user name and password authentication. If you have an account, ensure that you are logged in. You can login, reclaim an account, create an account and order a subscription from this page. 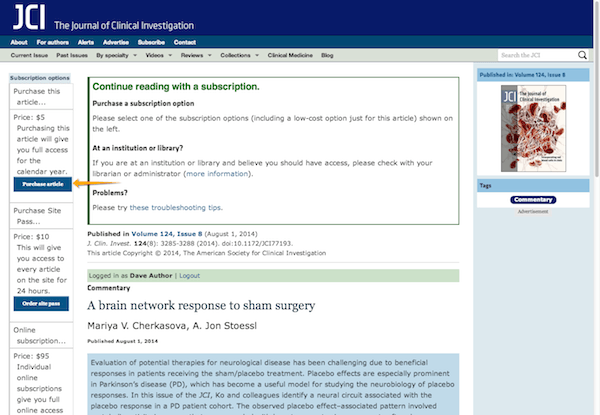 To purchase an article, you will need to go to the article, login with your user name and password and then select the Purchase article option (see image below for example). This will take you through the purchasing process and return you to the article. If you have successfully paid and still are unable to see the article in full or download the PDF, try some of these tips. 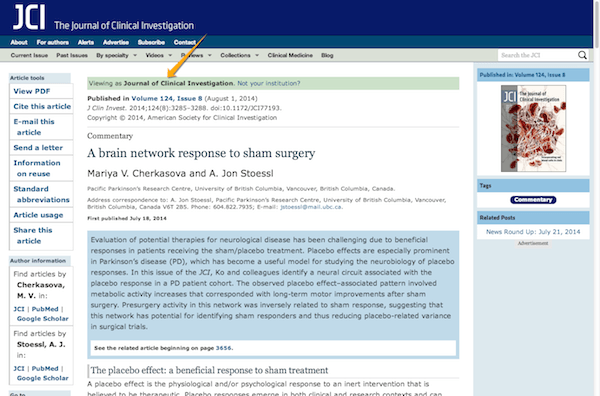 If you are able to read the entire article’s text, and your institution name shows up in the green bar under the banner (see image below for example), your institution has access to subscriber content. You need do nothing else. 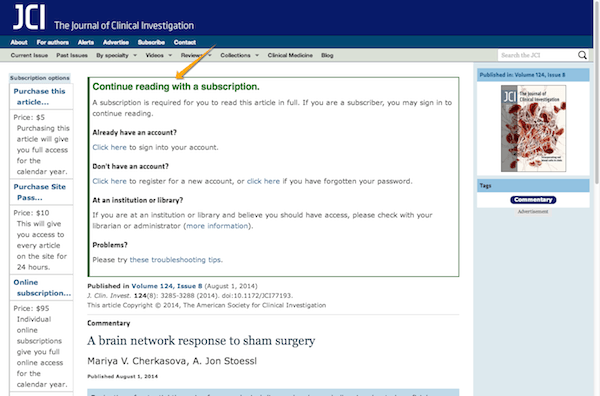 If you see a green box that reads, “Continue reading with a subscription” (see image below for example), we either do not have your institution's IP address information, there is a problem with the IP address information that was supplied to us, or there are other problems (see below). Clear your browser cache and cookies for www.jci.org and then try accessing again. Try accessing from a different computer. If you are able to access subscriber content on another computer, you will need to contact your IT department / librarian. Is your institution using a web proxy? Is the proxy caching web pages? Try to temporarily disable caching, then determine if that change provides access. If that solves your problem, you will need to ensure that www.jci.org is not cached. Find out which proxy and which version of that proxy is being used.